YouTube broadcasts itself with Google. Second Life thrives on Your World, Your Imagination™. Spook’s MI5 cannot save the United Kingdom without your help. These are three riveting illustrations where digital media is implemented with particular Web-based tools and applications and expertise. In each instance, the users, rather than the host platform, create a vast and rapidly growing community. All the individuals who, like me, maintain and become creative with 5+ social networking profiles such as Ning and Facebook; get involved and add information about live music events happening near me at fr?styl; (still) engage in seeding and peering movies and music ‘for free’; share everyday life 24/7 in 140 characters on Twitter; enjoy social media songs like ‘A Social Network for Two: A modern love song’; or contribute code to the Ubuntu developer community. You and a huge collective of others have become participants in digital development practices as many start-ups and established firms have embraced in one way or another (or through aggressive merger and acquisition practices like those of Google) some of the unique qualities of certain Internet applications and tools by actively articulating your creative and interpretative endeavors. The decline of the marginal productivity of the user is clearly illustrated through these examples. Facilitated by user-friendly and attractively priced (or gratis) software technologies, emerging sites for user participation are “all forms of digital culture, networked in technology […] and collaborative in principle.” This ‘participatory turn’ is viewed as new or alternative logics that favor new over old production-consumption configurations that, to some degree, assume that user participation (with particular attention to creative and collaborative practices on open and transparent, often corporate media owned platforms) are empowering and are the way of the future. And, while some critical voices can be heard , others hail it as the way forward to sustain growth and innovation in society. With this proliferation of digital technologies, rigid production boundaries have become increasingly porous as a growing number of users participate in copying, cutting, pasting and adding to existing media materials. Users engage in the production of meaning, whether of cultural texts, corporate intentions, or the technology itself. In many cases, participatory Web sites illustrate a rapidly evolving (yet often subtle) relationship of collaboration with users across previously existent production boundaries at a time where it has become “increasingly clear that the Internet is not only embedded in people’s lives but that with the rise of a more “participative web” its impacts on all aspects of economic and social organization are expanding” . This participatory phenomenon coincides with a strong interest in and awareness of the importance of corporate media owned platforms engaging with these active users. My interest in commercial media culture dates back to the late-1990’s, when I conducted research in Hollywood to investigate how the film actor became textually and culturally produced and constructed into a celebrity brand in an effort to enhance our understanding of “bankability” in the movie industry. This integrative approach to examine corporate and consumer interests in the production of both meanings and texts signalled, what has been termed, a participatory culture and pointed to a dynamic relationship between the strategic arrangements of the roles of the media company and the user base, underpinning the development of branded goods and services. This work fostered my later investigation of iterative media producer-user interactions with particular attention to the ways the media companies develop user participation into a market and the ways in which that market then enables and facilitates particular modes of user development. These sites then become sites of iterative feedback and learning for the media companies. In this paper, I draw on this background to identify how user participation is developed and maintained in the commercial context of a corporate media-based platform and how the user contributions relevant to their participatory experiences may benefit the company and the user communities themselves. The product perspective: Under this perspective, the brand is ‘filled’ with meaning by the marketer so as to add value and reinforcing costumer loyalty, while facilitating the consumer decision-making process and purchasing behavior. The role of the brand is to position the product in the mind of the consumer by adding a name, a set of signs and designs to the product or service. The identity perspective: In this view, the brand is defined as organization, product, symbol and personality. This identity then builds on the product view by adding a brand approach that is instrumental to competitive advantage and profitability. The relationship perspective: If brands can have identities, then the logic of the relationship perspective reflects a focus on adding and delivering value to consumers based on relationships developing between personified brands and consumers. Many forms exist of consumer-brand relationships akin to relationship partner qualities - similar to our everyday life partnerships. For a variety of reasons, these relationships can also fall apart. The cultural perspective: Finally, the brand is conceptualized as a cultural symbol. In this area of analysis, the collective of consumers rather than the individual highlights the brand as a social link. In blending insights from these perspectives together, we can return to the question of how a brand can be defined within the confines of this C3 Research Memo. The brand can be understood as a process that is evoked in a context and organization of contributors, knowledge, networks and technologies emphasizing social ties and experiences among customers that evolve around a brand designed to acquire, engage and retain customers. Some consumers have a desire to deepen their interest in branded goods or services, and form, develop and maintain communities in the pursuit of a shared enterprise, which is captured by the conceptualization of the ‘brand community’. The brand community then typically operates in a complex borderland joining established markets and participatory or social networks (associated with participatory cultures) together. In this C3 Research Memo, attention has been drawn to the rapidly expanding number of companies that have noticed ‘your’ creative endeavors in various online capacities. Increasingly, companies can be seen to invite and host virtual communities of consumption to join their platforms (which provide an unprecedented capability as resources of information). This memo is framed to identify the dynamics of contributing consumers as participants, creators and learners in the context of company-hosted digital development practices associated with branded products and services. By yielding insight into the ways participation and practices are structured and organized across company boundaries, this research memo has sought to provide a deeper understanding of the blending together of social dynamics and commerce as a significant aspect of the emerging knowledge-based economy. User participation in the context of commerce is a work-in-progress where goals, appearance, and usage guide a change-inducing result for the (configuration of) business. Such a dynamic of ‘give and take’ among constellations of participating members in the brand network demonstrates an interdependent relationship between the company and consumer base underlying product or service development that is simultaneously structured and emergent, top-down and bottom-up, centralized and dispersed, commercial and non-commercial. In other words, the architecture of user participation on the company-hosted platform suggests a complex intersection of designed and emergent development practices guided by various tools and support systems, attracting contributors with different interests, skills, and knowledge levels which results in different kinds of contributions and lessons to be learned. Yet the digital sky is limited. Some of these limitations are related to certain user preferences and practices that may be contrary to the company’s overarching strategy and therefore legal system, while others may point towards constraints of a more technical nature. 1. Cater to different member types. Gradations of user participation in development activities exist, highlighting differences in creative capacities and the contributions users make. Tracking how consumers may participate, the types of contributions they may make, and what kinds and how frequently interactions may occur on the company-hosted platform, is key to the cultivation of the brand network. 2. Toolkits! Since the early 2000s or so, home improvement shows make for popular TV. Since we cannot all be Ty Pennington or Martha Stewart, these kind of TV shows teach people at home the tricks of the ‘build and decorate’ trade. They demonstrate and explain which tools to use in what situation, how to use them, and so forth, enabling and facilitating people to transform their homes in a dream house according to their own liking. This ‘tinkering and toying’ to personalize one’s living space links user participation to customization, highlighting the role of tools. Providing (purposively) toolkits is a means of systematically outsourcing certain design tasks from the company to the user, assisting users in improving and developing new products and services. In this way, users are presented with a broader palette to participate, better equipping them to advance and develop products according to their own interests and needs, while contributing to brand development. 3. When you welcome customers, make them feel welcome. A commercial approach to user participation draws attention to the company’s openness, yet, in many cases, also has a closed meaning to it. In other words, the company encourages user participation but, by controlling parts of the design, implicitly encapsulates user development as proprietary extensions of the branded product or service. Users seem to find themselves in the peculiar situation of being in the business of creating proprietary experiences (bound by the company’s software) that can be commercial and non-commercial proprietary extensions of the brand, and this is particularly beneficial for the company. This raises questions regarding ownership and compensation. 4. Know what to learn from whom. Consumers seem to master and work around their particular interest, creating a centripetal force defined by core competencies developed by individual users. As a result, the company has access to multiple knowledge loci for establishing learning opportunities. Yet, there seems to be a point at which too many learning opportunities for the company may result in a ‘bottleneck’ which stagnates development and leads to user dissatisfaction and, arguably, increasingly motivates users to ‘do it themselves’ causing a ‘participation tipping point’. When the company is incapable of effectively dealing with potential learning moments, the company risks failing to learn. This may possibly endanger a transparent, effective, and trust-inducing interdependent relationship between the company and customer base that underlies the brand network. 5. Approach your platform as playground. It may already be hard to lure consumers to the company-hosted platform, but it is even harder to make a lasting impression that makes users want to log back in again and again. A combination of sociality, creativity, and innovative potential is likely to trigger intrinsic sources of motivation in a number of consumers. The participation process on the company-hosted platform should be playful. This experiential vision of consumption makes for an immersive online experience (visual, social, authentic, thematic, narrative-based, customizable, spreadable, simple and complex) The challenging task for the company is to coordinate, integrate and learn from its user base in order to nurture a self-sustaining brand culture. 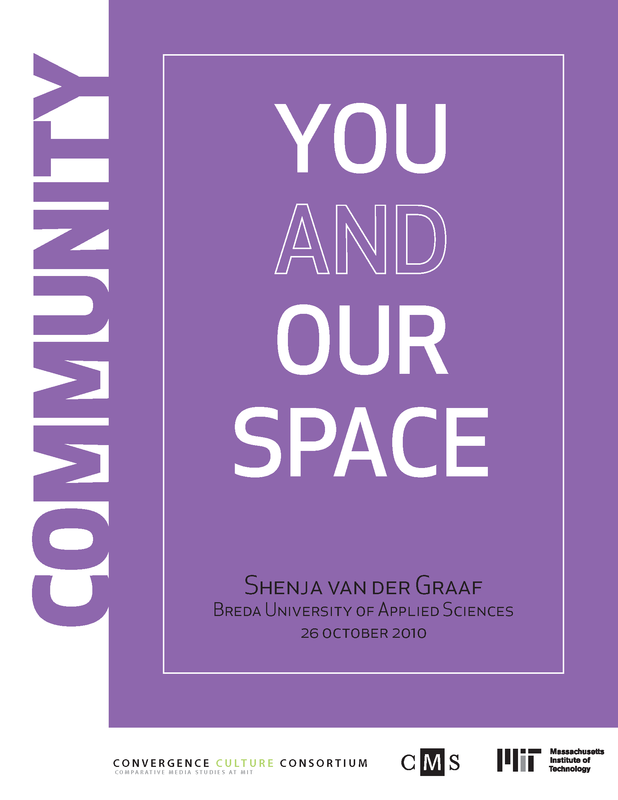 Shenja van der Graaf is Program Director of the Department of Imagineering and Lecturer in Business Innovation at Breda University of Applied Sciences, where she specializes in the management of innovation with a special interest in Internet-based innovation activities at the intersection of organizations and communities. As a Research Fellow at the London School of Economics and Political Science, she contributes to a socio-economic impact assessment for research projects (funded by European Commission FP7-ICT: Internet of Services, Software and Virtualisation). With an extensive background in and passion for the media industry (esp. film, music and 3D software), consumer cultures, and organizational transformation, especially in North American and Asian markets, she brings the perspectives of both management and economics, and the sociology of the developments and uses in these areas to her work. She was a Fellow at the Berkman Center for Internet and Society (Harvard) and the Research Center for Information Law (University of St. Gallen), and an alumna of the Oxford Internet Institute. Her recent publications can be found at shenja.org.